We’re proud of the fact Indow Windows are 100 percent Made in America and so is U.S. Senator Jeff Merkley. He launched his “Manufacturing Jobs for America” package right here in our cavernous North Interstate factory Friday! 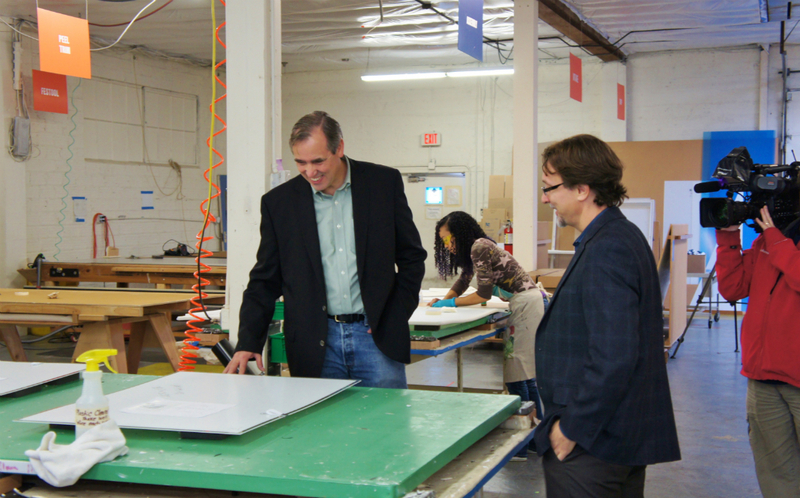 Sen. Merkley toured the Indow Windows factory, carefully examining the entire process – from how we cut the acrylic glazing for our thermal inserts to how we edge them with our patented silicone compression tube. Sen. Merkley clearly understands our goal is to make the built environment in the United States – from homes to commercial buildings – more energy efficient. He asked a lot of great questions! We were also honored to have State Sen. Chip Shields, D-Portland visit the factory at the same time to promote the need for a skilled and educated workforce. “In order to build smart and skilled companies, we have to build smart and skilled kids,” he said. 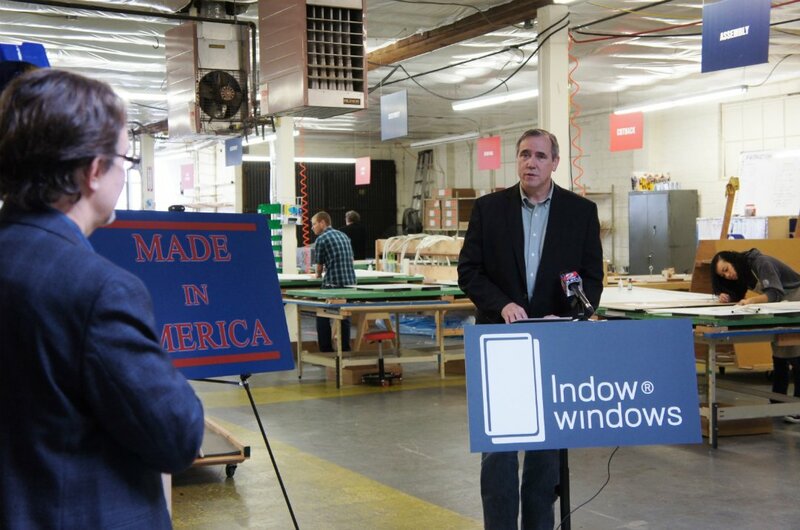 It’s companies like Indow Windows, Sen. Merkley said, that are helping to create needed jobs in the U.S. He is part of a coalition of 22 U.S. senators who have created a package of 40 crucial bills to modernize America’s manufacturing sector, help American manufacturers grow and create jobs and ensure Americans get the skills they need to succeed in the next generation of manufacturing jobs. Merkley is the lead sponsor of the BUILD Career and Technical Education (CTE) Act and Job Creation through Energy Efficiency Manufacturing Act and he’s co-sponsor of the Made in America Manufacturing Act. Indow Windows create jobs here in Portland. And we support jobs elsewhere in the United States. Our acrylic is made in Arkansas, Georgia and other states east of here. The silicone for our patented compression tube is made in Ohio. The foam that adds spring force to our tube is manufactured in Oregon. We custom make each acrylic glazing insert in our Portland factory so that it fits perfectly in any window in the 26 states (and growing!) we now sell in, no matter the window’s shape or size. Sen. Merkley even got to see the sustainable, recyclable packaging we use for all our Indow Window shipments! Indow Windows make people comfortable by eliminating cold drafts and reducing energy bills. But we also provide the comfort of this: knowing that buying Indow Windows supports jobs here in the United States, which makes us stronger as a nation!